Please note that this page is still in review and is being updated frequently. Feel free to leave feedback in the comments below but beware anything not constructive will not be published and/or removed without warning. Trouble in Terrorist Town is a game mode with a relatively simple concept to it. There are 2 base teams and a third sub-team that makes up part of the 2 teams. During a game the majority of players will be on the innocent team, a few on the traitor team and the smallest number plying the role of detective. The ratio of detectives, traitors and the innocent teams can be changed so this differ on some servers. The default ratio is 25% of the players will be traitors and 13% of players will be detectives with the rest being innocent. At the start of a round all the players are randomly selected to be put on a specific team according to the above ratios. The goal of the game is for the innocent players to survive and kill all traitors and the traitors have the same goal of trying to kill the innocent players. As a note to this the detective role is classed as an innocent player with special abilities which will be covered below. In TTT you get weapons by picking them up off the ground (walking over the guns and ammo). Note you can only have one weapon in each tier / weapon slot so you may need to drop your current one by hitting Q. Open the console – this is the ~ (tilde) key by default. How do I get equipment as a Traitor or Detective? You can purchase equipment through the “C” key. The number of credits you have is displayed on this screen and the equipment available will vary between servers. How do I get the quick chat commands? The fastest way to do this is to bind a key to the suit zoom key in the Garry’s Mod settings menu. The above command will bind the “Yes.” chat option to the y key. traitor <player’s name you’re looking / aiming at> is the traitor! As a traitor how can I hide a body? You can hide the body of a dead player by moving it to a place that players can’t get to or see on the map using the Magneto-Stick which is usually in weapon slot one. Your other option is to purchase the flare gun which lets you shoot and burn bodies of other players which disappear from the map. Note: Some servers may have custom equipment that may extend these options. I entered a room / area and suddenly died. What happened? As an innocent / detective you probably entered a traitor only area of the map. These areas will kill you instantly and without warning. As a traitor you may have entered a traitor tester. On some maps these will kill you. Props are moving randomly in game? When players are dead they can posses props and move them in game. Generally these movements are fairly restricted however some servers have an increased amount of movement set. Also to note these moving props are still props in game and can push and block the path of players in game. As an innocent your goal is to survive the round and kill all the traitors. Innocent players need to carefully watch other players and figure out if they are innocent or a traitor. Voice chat makes this a lot easier as you can communicate with other team mates and figure out what has happened as a team. This also makes you less vulnerable as you don’t need to stop to type in chat. Beware to not take any actions that might make you seem suspicious to other players such as trying to draw players away from a group, isolating yourself from the other players or things that may be classed as suspicious by the server rules these can include things like shooting weapons without cause and not identifying bodies if you pass them. As an innocent player you do not have the scoreboard update in real time to show players that are alive and dead. Instead the scoreboard goes through a missing phase when a player has not been seen for a while to a confirmed dead phase once the body of the player has been found and identified. Identifying bodies as a player also provides you with valuable information about how a person died, what their role was and how long ago they died. Use your surroundings and environment to your advantage for example most maps have a traitor tester. This will check a player and indicate if they are innocent or a traitor providing a way to confirm / validate a players identity. Warning: Areas where a tester is located can become a good mass kill spot for the traitors as players tend to build up around a tester so be careful about bunching up. As a traitor your goal is to kill all the innocent and detective players. You will see your follow traitors listed at the start of the round and they are also identified by the T icon above their head in game – Beware only traitors can see this icon. When killing other players you need to be smart as bodies store information – You want to kill people without being seen and without the players seeing you last as this is recorded on their body and may be used to trace the kill back especially if your the last seen person on more than one body. After your kill you want to leave the area as being near unidentified bodies may give you away and not identifying bodies can be a classed as a suspicious action. Some servers have rules against killing people near the bodies but not all do and this still makes you suspicious. You can get rid of bodies by moving them to hard to reach areas or by purchasing a flare gun and burning the bodies which destroys the evidence of the kill. You also gain special equipment (like the flare gun mentioned above) which may help you win the round. For example C4 which kills everyone in it’s area after the timer elapses or someone fails to defuse it. These sorts of weapons can be good but may also kill your fellow traitors if not used carefully. As a warning being seen holding your equipment (Equipped / selected) will give you away as a traitor and will most likely get you killed. There is an exception to this as in some instances an innocent player can pickup traitor weapons however servers usually have a rule such as announcing you have got a traitor weapon in chat so your not killed when seen carrying it. Traitor testers are the bane of a traitors existence as they will instantly give away your role or kill you if you step inside a working machine. Some machines can be destroyed which makes the useless however if your caught doing this you will most likely be issued with a KOS (kill on sight). Some maps will also have traps that traitors can use to kill players such as parts of the map that collapse or explosives that go off. Traitors should be careful of these as they are good way to get kills however will lead to a KOS if your caught activating one. As a side note you need to be careful of the locations of other traitors as you don’t want to kill your teammates causing your karma to drop and lowering the ratio of traitors to innocent players. Players assigned the detective role in a game are largely the same as innocent players however they have access to special abilities, equipment and information. The detective player base is assigned tot he fewest ratio of players (12.5% or 1 detective for every 8 players by default). As detectives can help track down and identify traitorous players they are generally regarded as targets to eliminate early on in the game so beware of who is around you and try not to isolate yourself to much from other players to make killing you more of a risk. By default a detective will get more information from a dead body than a standard player such as the person he last saw. Equipment can be purchased by detectives that help expand the tools the detective has. 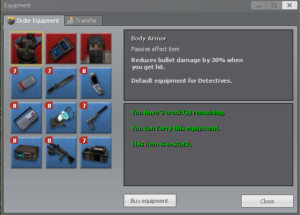 In a base game detectives have access to the following Equipment: body armor, radar, visualizer, binoculars, diffusal kit, DNA scanner, ump .45 prototype and a health station this list can be changed and expanded with addons / mods for the game so I will not go into detail of the equipment. The different equipment each plays a different role in the game and if used correctly can help change the playing field and identify traitors. 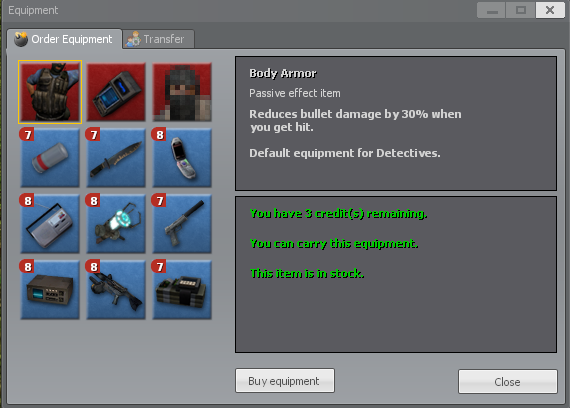 Equipment can be purchased the same as a traitor player using the buy menu which is the C key by default. 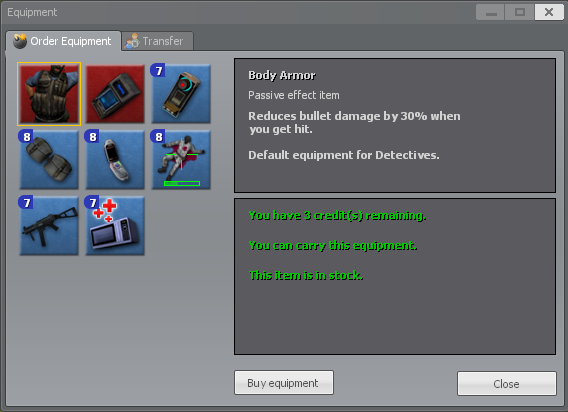 Detective players can pick up unspent credits from dead detectives and traitors. They also all gain a credit whenever a traitor is confirmed to be dead. In most / all maps a traitor tester will be present. This is a machine that examines a player and identifies them as an innocent or traitor. As a traitor beware of these machines and in most instances if people are trying to test other players you want to keep your distance – Some of these machines will kill you instantly and others tell the nearby players your status. As a innocent / detective you will want to put as many players through the machine as possible as it will tell you who can trust – Beware the location can be a good target for traitors as generally a few players will build up there so could be attacked with high damage weapons / equipment such as C4 to wipe a group out. As in most games once you are dead you will not spawn again until the next round. However there are a few differences with death in TTT which are outlined below. If an innocent player dies other innocent players will not know they have died until their body is found. This also reflected on the scoreboard as it will not show dead players as dead until they have been found. As a player when you find a dead body you want to identify it by pushing E when looking at the body. This will provide information on the what happened to the person and may help identify a terrorist. Be-aware that walking passed an unidentified body on some servers may be classed as a traitor act and could lead to you being killed. Karma controls how much damage you deal to other players. Low karma means you deal less damage where high karma is higher damage. Generally 1000 karma is 100% damage. You lose karma for damaging team mates (You lose less karma if the person you damage has a low karma score already). You gain karma (Up to 1000 max) by playing rounds where you don’t injure teammates. As an innocent or detective player you also get karma for injuring traitors. Be-aware that the scoreboard does not show karma in real time and only updates at the end of the round. A players karma is also displayed when you look at them this changes from green “Reputable” through to red “Liability”. In trouble in terrorist town the chat has three modes. Dead players and spectators are unable to communicate with the game – voice and text chat is only heard by other spectators. Traitors can use both the standard voice and text chat that is heard / seen by all players or they are also able to use traitor voice chat to talk only to other traitors. The last mode is the normal chat for all alive players which innocent and detectives are able to use. Please note this page is a work in progress and will may be updated to include further information.